Bring on the butterflies! A Seedbom mix of nectar rich wildflower seeds will launch your garden into a butterfly haven. Full instructions are included on inside of each Seedbom sleeve. A 100% biodegradable seed bomb to help bring on the butterflies! 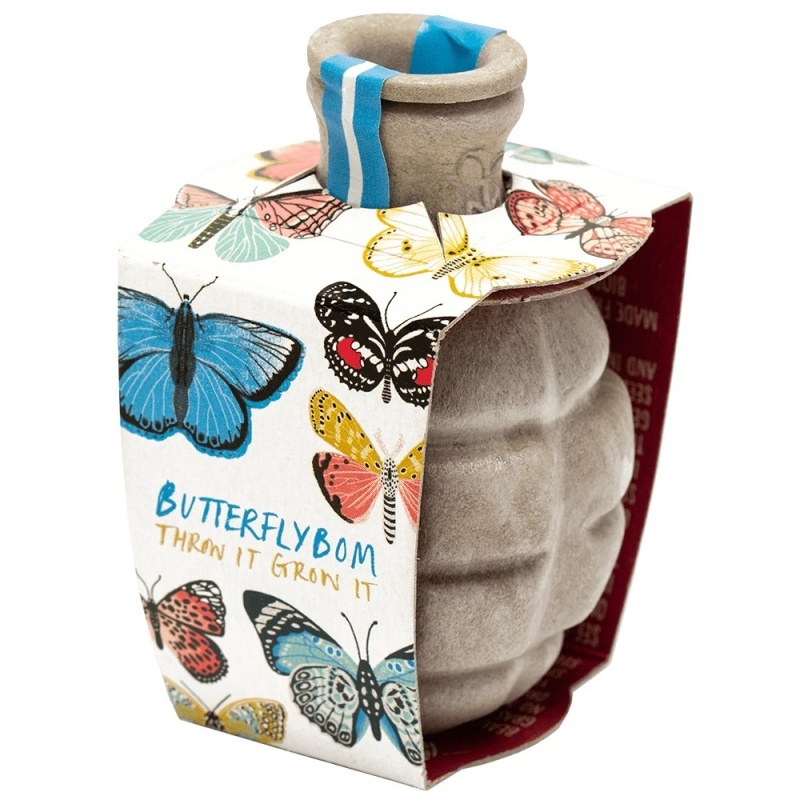 Shaped like a grenade this mix of nectar rich wildflower seeds will launch your garden into a butterfly haven. This seed bomb will also help to promote butterfly populations as well as other pollinating insects. Seed mix* – Cornflower, Corn Marigold, Birdsfoot Trefoil, Common Vetch, Field Scabious, Kidney Vetchm Common Knapweed, Musk Mallowm & Tufted Vetch. Pull the pin and throw or drop Seedboms into areas that are in need of brightening up. Seedboms like bare soil, natural light and to be kept damp whilst growing. Full instructions are included on inside of each Seedbom sleeve. Seedboms are assembled in the UK (shell casings are made in the Netherlands, all other materials sourced in the UK). Starch based biodegradable and compostable shell, organic peat-free compost, native wildflower / herb seeds, FSC 100% recycled and recyclable glue free paperboard packaging.